When I registered for the Indian Food Bloggers Meet, little did I expect this excitement and anticipation! Apart from the all the events planned at the meet, there are contests with tempting prizes to be won. Team IFBM first gave us 'plum assignments' as some of my fellow bloggers put it, and then one with corn. Now, you can't be a food blogger and not lust after every little thing which has potential to be a prop. Especially if it is cheerful looking colorful bake ware! Freedom Tree, Latika Khosla's niche design studio specializes in furniture, fabrics, lamps, rugs, kitchenware, bake ware among other things. Not hard to guess that the prize for the Freedom Tree Contest is a special hamper of bake ware! Being true to my community, eying that hamper from that vibrant collection, here comes my baked savory dish with fresh corn as one of the main ingredients. Fresh and juicy corn on the cob is a treat in itself. In a creamy herbed sauce, it makes a delicious dip or topping. 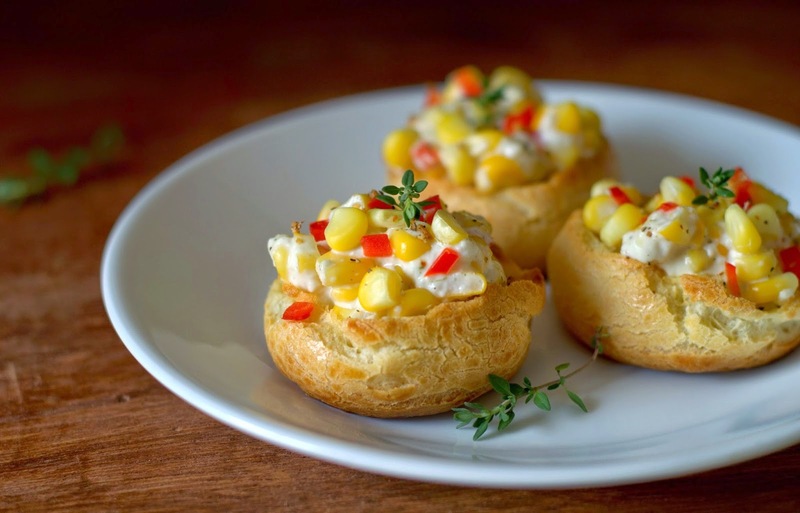 Here comes creamed corn filled in the custardy interiors of savory choux puffs. Method: In a bowl, whisk together the cream, milk, onion powder and flour. Set aside. In a medium sized pan, on low heat, heat the butter with the grated garlic. Do not let it brown. Pour the cream mixture and stir constantly till fairly thick and very creamy. Stir in the corn, herbs, salt and pepper. Stir in the cheese. Taste and adjust the seasoning. Variation : You could also try stirring in some basil pesto or mashed roasted red peppers into the corn filling. Michel Roux's recipe from Finla's blog . Please do watch this video here if making choux pastry for the first time. Ingredients - I made about 12 small buns with half the recipe below. Line your baking tray(s) with baking parchment. If piping the pastry, have a pastry bag fitted with a plain nozzle or just a coupler, folded and poised over a glass to spoon the pastry in. You could also just spoon the dough using 2 spoons. You will need a spatula, a wooden spoon, a heavy saucepan, another medium sized bowl to beat the pastry in. A hand mixer or a stand mixer. You could also beat by hand. A stand mixer makes it very easy. A pastry brush to glaze the tops. Method : Mise en place. Pre heat oven to 200 C / 400 F.
Sift the flour with the onion powder. Keep it in a bowl near the stove. Take the butter, water, milk, sugar and salt in the saucepan. Over low heat, bring the water to a rolling boil. The butter should melt before the water starts boiling. Take the saucepan off the heat, dump all the flour at once into the boiling water. Stir rapidly with the spatula or wooden spoon till the mixture is smooth and starts coming away from the sides of the pan. Put it back on the stove, over medium heat. Vigorously stir the flour mixture without stopping. Keep beating till it forms a thick smooth ball, a slight crust at the bottom. This may take a couple of minutes or longer. Quickly, transfer it to the waiting bowl (or the bowl of the stand mixer*). With the hand mixer at low speed in the bowl, slowly start adding the whisked egg little by little (one by one) to the hot dough. I half expected scrambled eggs! Increase speed to 3. Make sure the egg you have added is fully incorporated into the mixture before adding more egg. At first you will see the mixture break up and look curdled. Then it will gradually come together. Keep adding the whisked egg, checking the dough for consistency when about 2 tablespoons of egg is left. Using the spatula, drop some of the mixture into the bowl. If it falls in a thick ribbon/ curtain, you are there . Do watch the video. If the dough doesn't drop or is very thick , add the remaining egg, beat again till fully incorporated. Check again. I had to add about 1 tablespoon more for HALF the recipe. If the dough kind of just flows down, you know you have added more egg than you need to. Transfer the mixture into the pastry bag (not sure if you could keep the dough waiting). Pipe about 12 mounds of pastry spaced 2 inches apart. Brush with the beaten egg. The pastry must be puffed, golden on top, dry and crisp. To test, bake 20 minutes, take one out of the oven (still on), break open. If the insides are wet, score the shells and bake for 5 minutes more. Its fine if the insides are moist. These taste good warm too! Reduce the oven temperature to 180 C / 350 F. Cut the buns into half, pull out any moist centers. Brush the outer part very lightly with the garlic butter. Bake for about 5-10 minutes or till crisp. Cool about 5 minutes, fill with the creamed corn and serve immediately. If not using the puffs immediately, cool them after baking the first 20 minutes, store them in an airtight container. Bake the second time just before serving. 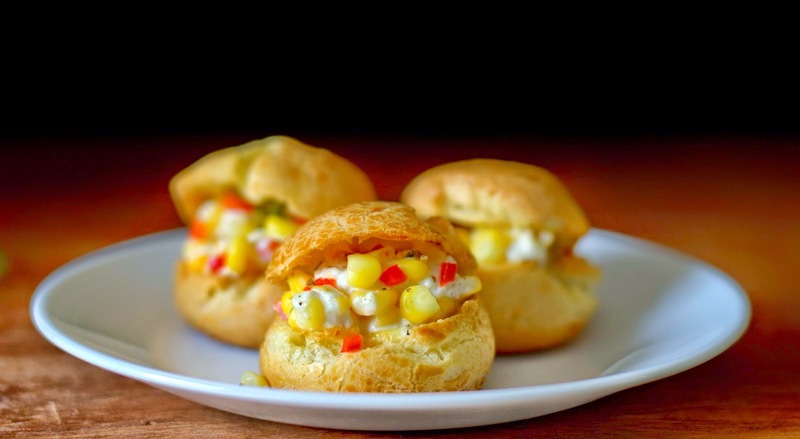 You can freeze the baked puffs. Defrost the puffs and then reheat in a 350 degree F (177 degree C) oven for 5 to 10 minutes, or until crisp. Happy PS : I think I am making progress with choux pastry! I like these buns still soft and warm from the oven. They should taste good filled and eaten when soft and fresh (not cold and soggy!). Vary the amount of filling as you please. 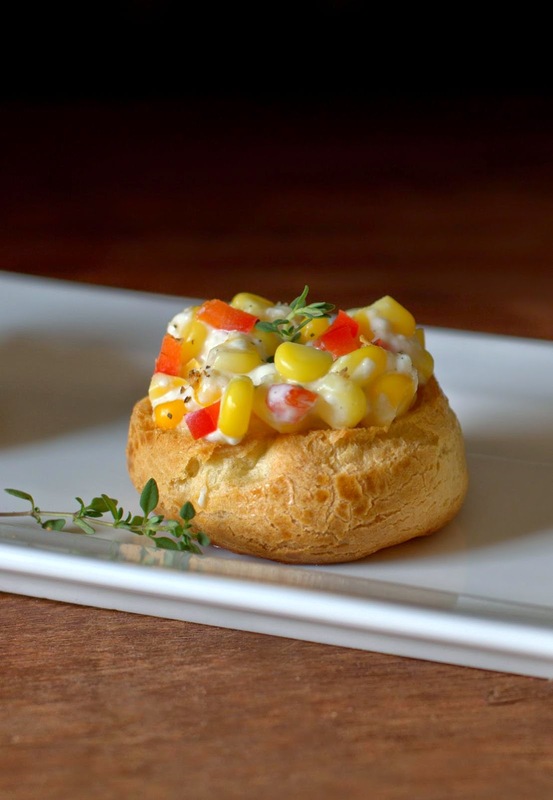 Expect more choux pastry based recipes here! These puffs are my entry to the IFBM and Freedom Tree Baking Contest. DISCLAIMER:*This post contains affiliate links. This means if you click on the link and buy through the link, I will earn a tiny commission on the same. I recommend products which I have used and found good or products I would consider for myself based on recommendations from my trusted baker friends. There will not be any extra cost to you. This commission will help me with me costs of running the channel and bring out more videos for you. Your support will be greatly appreciated. Choux pastry looks perfectly done. When will I bake even half as good as you, sigh! Those creamed corn kernels look like jewels in a bowl. Amazing entry to the contest, all the best. Beautiful Suma! 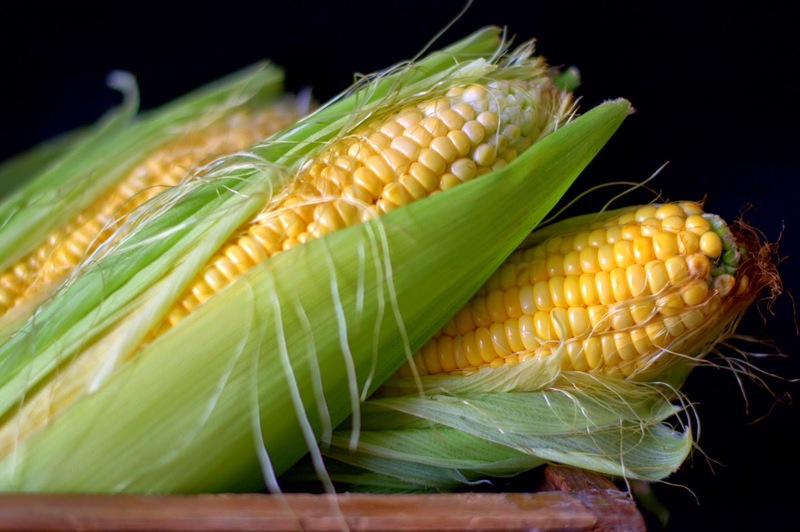 Lovely and innovative recipe for corn.